COMMUNITY BAPTIST CHURCH - Reverend Richard Lewis, Jr.
Reverend Richard L. Lewis was born October 23, 1957 in Cleveland. Ohio. He graduated from Cleveland's John Hay High School in 1976. Rev. Lewis accepted Jesus Christ as his personal Saviour and was baptized in November 1964 at the Starlight Baptist Church under the leadership of Reverend Edward Small. He then accepted his call to the Ministry under Pastor Small and preached his first sermon August 10, 1979. Reverend Lewis married the former Vanessa Thomas December 17, 1977. Throughout their union God blessed them with two wonderful children, Shequita and Richard Lewis III. They are also the proud grandparents of one granddaughter, Jamaica Lewis. He also enlisted and served in the United States Air Force for four years and was honorably discharged in 1986. His religious education consisted of attending the East Cleveland Bible Institute. There he completed course of study in Bible Synthesis with focus on Old Testament Survey and New Testament. 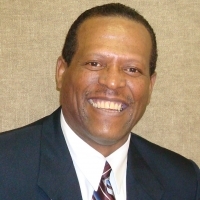 Reverend Lewis graduated from the World Christian Training Center evangelism studies Cleveland chapter 1981. He's currently serving in the capacity of an Associate Minister at the Community Baptist Church, Henderson, Nevada, where he feels blessed to be under the leadership of Pastor Sam Roberson since 1991. Since being under Pastor Roberson's leadership he's been blessed to serve in many capacities, Male Choir Director, Choir Member, Sunday School teacher and currently Wednesday night Bible instructor.